Five crazy good cheeses known sure to please your guests (roughly 2 pounds total), plus crunchy marcona almonds, sweet and savory spreads and two French baguettes. Tray is 16" in diameter. Include salumi on this tray by adding the ADD SALUMI item to your order. Include olives on this tray by adding the ADD OLIVES item to your order. Include honeycomb on this tray by adding the ADD HONEYCOMB item to your order. 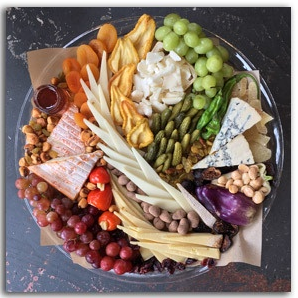 Our trays are presented on reusable crystal clear platters and include dried fruit, fresh fruit, cheese name tags, surprise seasonal accoutrements and bamboo spreaders. This photo is an example only as trays are like snowflakes - no two are alike!